Hi! My name is Tate, and I am a Washington and Lee student who is participating in the Connect-123 internship program. 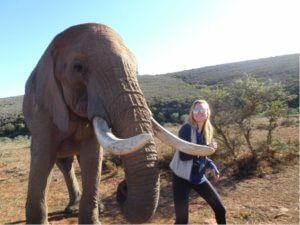 This year, we summer interns were lucky enough to go on a safari during our time in South Africa. What follows is a collection of photos from our majestic and wild weekend away! 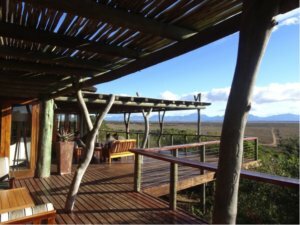 We arrived on a Friday and were immediately taken aback by the incredible views of the lodge. Not knowing quite what to expect, it was crazy that an elephant was walking around as we drove into our breathtaking accommodation! We took a quick trip to the reptile house where we were greeted by the snakes from our scariest nightmares: cobras, rattlesnakes, mambas, and more. With them safely behind cages, it was so thrilling to see these animals in real life. 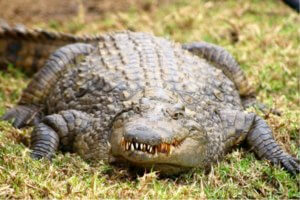 We also saw crocodiles lying as still as statues awaiting their prey. We were also greeted with birds of all kinds flying around and showing up their unique colors, with springbok prancing off in the distance. 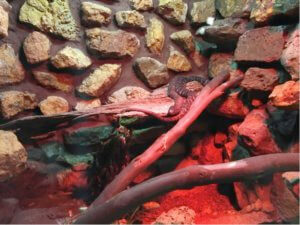 A visit to the reptile house left us all shivering. He lay as still as a statue, not moving even the slightest muscle. We then returned to the lodge for our first filling meal, which included a seriously delicious fudge brownie that we all ate right up. 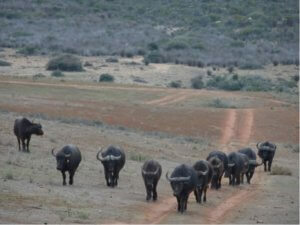 After unpacking in our rooms and enjoying some pre-safari tea or coffee, we met up with our guide and took off. 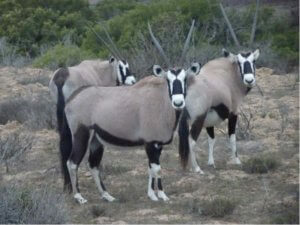 The oryx are too cute. This giraffe looked like a gymnast. The king of the wild, without a doubt. The first drive was incredible, some highlights including seeing springbok, rhino, wildebeest, oryx, zebra, ostrich, buffalo, cheetah, lion, eland, and an owl. Seeing animals so gracefully in their natural habitat, undisturbed by outside forces. If you ever get a chance to see this, do it. There’s something truly spectacular about it. 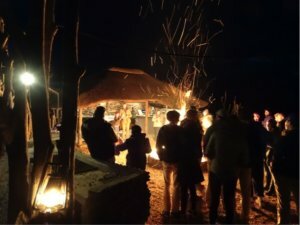 We returned from our drive to a bonfire that prepped us for a full buffet, with ostrich, deer, fillet, chicken, salad, potatoes, and basically anything you could ever want. There was an extensive wine bar, desserts, and overall delicious happiness for the whole group. Ever since that weekend, I’ve been craving to return to the buffet. We all went to bed; ready to get up for our 7 a.m. drive the next day. Nothing like a bonfire to warm the heart. We were up bright and early for the next day’s drive. 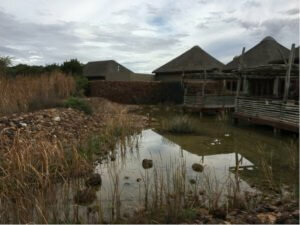 During the second day, we found a sanctuary nearby that let us walk with and feed two elephants and an ostrich. Robs, our C123 guide and friend, arranged transportation and helped us have a day we will never forget. 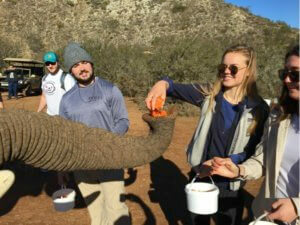 How to feed an elephant, part 1. I got to walk alongside this giant! 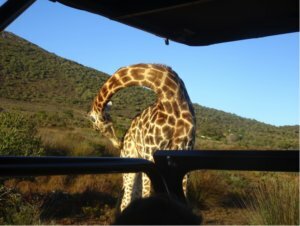 On our Saturday afternoon drive, we saw lots of cool animals, including giraffes and elephants up close. It’s safe to say we were all dazzled by these magnificent creatures. 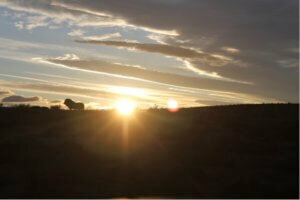 That night we took a night drive, which exposed some wandering hippos hanging out with grazing buffalos. We also saw a bunny and the crystalline stars lighting up the night sky. Although the pictures came out a little dark, trust me, it was awesome. 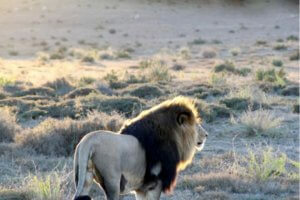 The king of the bush surveys his territory as the sun sets. For the whole trip, breakfast, lunch and dinner were all superb, the sunrises and sunsets viewed over the safari were simply luxurious, and saying goodbye to our temporary home on Sunday after our last morning drive was hard. We’d like to thank Connect-123 for making this whole trip possible for us, but particularly for this weekend. 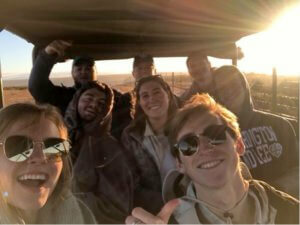 It was a “lekker” time in my life that I will talk about forever, and I hope you’ve enjoyed seeing a little piece of our incredible safari trip! 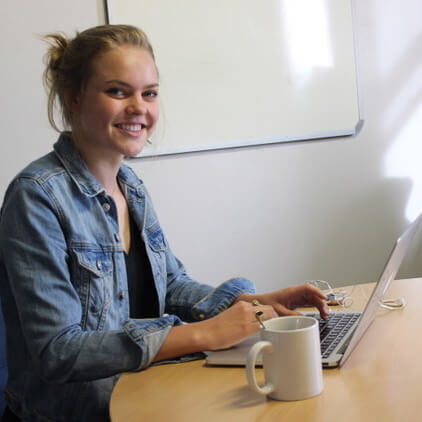 Connect-123 facilitates internships in Cape Town in a wide variety of industries. If you are interested in an internship in Cape Town, click here to get in touch! Hi! My name is Tate Mikkelsen and I am a junior at Washington and Lee University. I am currently studying Business Journalism, and my time in Cape Town has inspired me to look more closely at incorporating global politics into my studies. This summer, I was lucky enough to complete my journalism internship in Cape Town, where I wrote different published articles that catered to the working class. 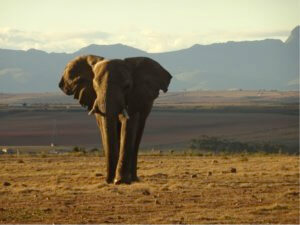 It was an incredible experience, and I loved getting to know the lovely people of South Africa and traveling.